Oh, my chickens how I love thee though every creature wants to eat thee! Night and day I slave away, hammering, nailing, foaming, fuming…..
You cluck and cackle at my efforts, Oh fowl brain! If only I could make you understand. This I do for your protection because for you there is no resurrection! Begging for a bit more scratch not knowing it could be your last. And so I go, constantly seeking just the right board or brick or snare that will keep you safe in the cool night air. Then rise and go to your coop again to make sure those predators can’t get in. Dedicated to my favorite chicken whom I hope to find in heaven, if there are chickens in heaven. Which I feel sure there are although maybe not specific chickens, but God loves us so who knows. If dogs go and they often kill the chickens I think chickens should get first shot……but that is a discussion for another day…. 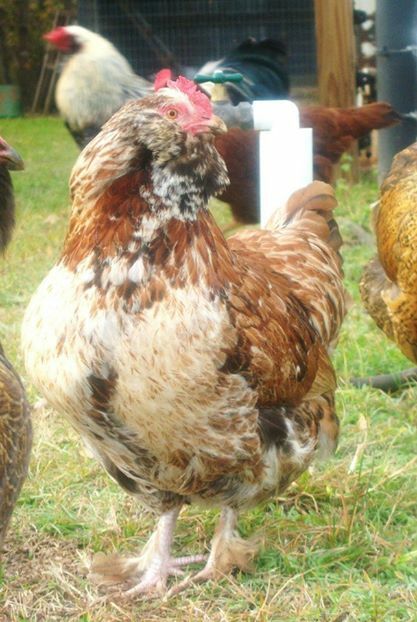 Check out this link to one of my favorite places, My Pet Chicken, to learn more about my favorite breed, pictured above. I love beginning my day by reading your blog!